For quite some years now I have been aware of the role of cork in making a great wine but I have just recently become aware that cork could work its magic on audiophile equipment as well. I owe this new-found awareness to Sound Quest's Isol-Pads and, not to a small extent, to John Potis who pointed them out to me as a great and inexpensive way to extract an additional level of performance from my system. 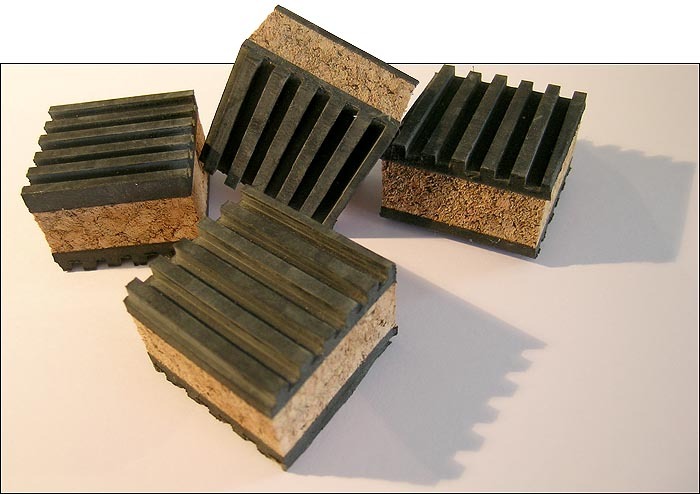 The Isol-Pad is a small vibration absorption device, about an inch thick, made of 2 layers of high impact rubber with a larger layer of cork in the center. Sold by Quest for Sound in packs of 4 for $25 per set, they are one of the cheapest and most effective tweaks I have tried so far and as each pad can carry up to 75lb, there is little risk of abusing them except with the heaviest of amplifiers (and even in that case, I suppose the number of pads could be increased to 6 or 8). There is no esoteric explanation or magic involved in what the Isol-Pads will do for your system and contrary to the corks used on some of the most prestigious wine bottles, no legend is involved about mystical oak forests in southern Spain or harvesting times dictated by the cycle of the moon. The best of corks allow a wine to breath and will control gas exchanges with the environment in a slow and regular fashion, allowing the wine to develop all its aromas and its complexity over time, without one of the aromas overwhelming the others or unwanted tastes creeping into the bottle. A great cork will give time to the rough tannins of a young wine to oxidate and develop into a complex palette of flavors. And that's what the Isol-Pads did in my system. Now, wouldn't it be wonderful and easy if just dropping the four blocks under CD player and amplifier had instantly delivered an impressive improvement and I could tell you what the pads did for me and we could all move on? Unfortunately, as for all good things, it is never quite that simple. If you want to know what I was expecting, just refer to John Potis' review of the Musical Fidelity A5 CD player and amplifier. As he wrote, the cases of these 2 pieces are very lively and controlling the vibrations of those should yield instant gratification and improvements. In more than one way it did but not in the form I expected. The first time I introduced the pads into my system, I was baffled. Where I was expecting better definition and more detail, I had lost most of the detail I am used to hearing in some of my favorite discs instead. At the same time the violins and cellos seemed to have lost some life and recessed almost into the background. I have to admit that after an hour of listening to Rebel's "Les Elemens" directed by Marc Minkowsky [Erato 2292-45974-2], I just removed the pads. The music had lost the shine and sparkle I am used to on the top end of this record which normally just sizzles with life. It was a disturbing experience as I should have been hearing the same improvements John had observed and which drove him to put Isol-Pads under all his gear. After a few e-mail exchanges and a few weeks to calibrate my ears (after all, my A5s had been in my system for only a few weeks and I did not know their sound as well as some of my older gear yet), I decided to try again, this time keeping in mind John's words of wisdom - focus on the elegance and refinement of the midrange where the soul of voices and strings resides, as well as the precision of imaging and soundstaging; good advice indeed to the rookie tweaker I am. So here go the pads again, four under the A5 CD player and four under the integrated amplifier. I cue up one of my all-time favorites, Radu Lupu leading in Beethoven and Mozart's Piano and Wind Quintets [Decca 414 291-2]. And this time, no miracle, I heard the same thing as the first time - the usual details were gone and the clarinet and horn seemed to have recessed back. But this time, being so utterly familiar with all the subtle details of this recording (it's been spinning in my CD players for close to 15 years now), I was also able to fully understand what was going on. It revealed a hidden world of music to my very surprised ears. In the second movement of Mozart's quintet, there are a couple of times when one can hear the clickety sound made by some of the keys of one of the wind instruments - unfortunately I am not enough of an expert to tell which one it is but I am sure Srajan being a clarinetist could pick it out instantly. With the pads on, these clicks could still be heard but they were not attracting attention to themselves. What the system now revealed is that the clicks were not the important thing going on at that precise moment. The delicate and emotionally loaded musical phrase is what really mattered. Coming to this realization allowed me to also become aware that details had not disappeared at all, they were all there. Those not relevant to the music were simply drawn back - still within audible reach to convey the ambiance of the recording session but never loud enough to distract from the music itself. It also helped me realize that the 'enhanced' level of detail I had heard so far without the pads was actually due to a slight emphasis in the upper mid/lower treble (the realm where violins thrive) that I had never noticed before but was obvious once removed. To appreciate the Isol-Pads I had to travel the mental journey that took me from seeing this as a loss of detail to seeing it as an opportunity to hear deeper into the music. Not an easy step for me as I started my audiophile career with Rogers LS 3/5a speakers. They use a judiciously bumped up upper midrange to give the illusion of hearing deep in the musical mix which gives this speaker its unique talent with voices. Once I was able to listen past these de-emphasized strings or voices and enjoy a more neutral and refined presentation, I was rewarded with an incredible wealth of detail I had never heard before; notes from a horn that I thought were uniform revealed they were instead made up of a multitude of small variations as the hornist modulated the strength with which he blew into his instrument. It gave me the feeling of being one level closer to a live concert, by allowing some of this micro information to reach me when until now it had been buried under some of the more obvious but somewhat less meaningful details. And what about imaging and soundstaging do you wonder? To get a good feel for this as well as what an impact the pads might have had on bass performance, I grabbed a more recent but just as involving favorite, Renaud Garcia-Fons' Entremundo [Enja JENJ 3318-2]. I do not own all of this incredible bassist's recordings but Entremundo is an absolute favorite of mine for its sheer joy, brilliance, energy, passion and an amazing ability to blend genres and influences. I love the other albums I own but Entremundo is just a tad above the rest as far as I am concerned (but I still have a few of his major works to discover!). If you don't know this artist yet, do yourself a favor and read the reviews of his work on 6moons and grab Entremundo at your favorite music retailer. What his complex music of five-string bass, flamenco guitar and percussions (and all sorts of guest instruments and voices brought in for an even broader tonal variety) revealed was a slightly narrower soundstage but my FJ OMs spread 8 feet apart throw a gigantic stage over the 15 feet width of my listening room and the reduction was really not that dramatic. I might actually venture as far as saying that the soundstage was brought back down to a more realistic scale. In exchange for this very moderate downscaling in width, I got a much deeper presentation and a much more defined position for all the instruments (at least when Garcia-Fons does not play tricks during the mixing, creating phantom instruments responding to the main ones as he sometimes favors). One of the minor drawbacks of omni designs (which the FJ OMs partially are) is that imaging can sometimes be fuzzy with the various registers of an instrument sounding localized in various parts of the stage. The OMs, thanks to their tweeter directed towards the listener don't suffer from this syndrome as much as some other designs I have heard in the past but on occasion the location of a string instrument could waver as the music traveled from low to treble registers (especially with very extended instruments like a cello or Garcia-Fons' 5-string bass). With the Isol-Pads in place I no longer notice any undue softness or imprecision in imaging. The OMs now deliver a balance of clearly located instruments gently blending into each other when the music calls for it or clearly separated when needed. Finally bass, another usual subject of improvement with vibration control tools, did not get deeper and the OMs did not suddenly turn into B&W 800Ds but the bass gained in tightness and speed just a bit. My system is not designed to be the ultimate in dynamics, slam or bass extension but the Isol-Pads just brought a little more control over all those elements - another little step closer towards the illusion of being there. As a great cork on a vinegar bottle will not make a Saint-Emilion Grand Cru, the Isol-Pads will not turn a poor record into a jewel. But in the same way as a great cork is essential to let a promising harvest reveal all its flavors, the Isol-Pads allow more of the hues and nuances of the music to be revealed by giving a chance to the most subtle parts of the musical signal to reach the listener. It is usually the multi-thousand dollar shelves and racks that improve the retrieval of the finest nuances within notes but the Isol-Pads get you a fair way down this path for $25 per component. What isn't there to love?